Remember when I told you I got two E.L.F. polishes for my mom? One was Moonlight polish, the other one I got was E.L.F. Blush nail polish. I was not convinced by this copperish shade with frost finish. I like how it looks in the shade, but I really dislike it in the sun. I used two layers. Application itself was not problematic, but there are visible brush lines due to the frost finish … and stiff brush does not help. 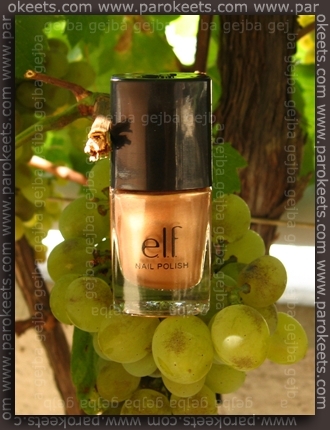 I bought it at ELF internet store for approximately 1,7 EUR (2,5 USD) + shipping. Bottle holds 10 ml (0.35 oz) of polish. As you can see pictures were stored in the archives for quite some time. I took them in September. 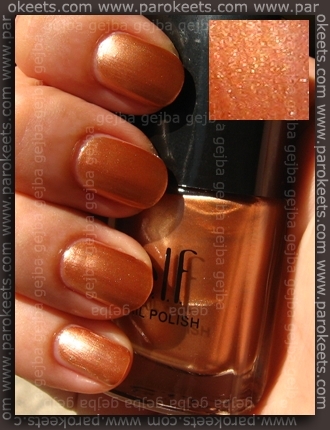 What can I say – I really disliked this shade. 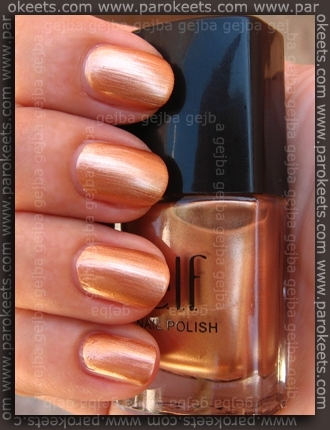 Previous articleKOTD: Essence Meet You In Budapest + Ciate Golden Globe + p2 So Cool! Pretty shade on you. I’ve never used anything by ELF. Meni je všeč, no. In prav lepo zgleda na tebi! Kak konad mu pa itak ne bi škodoval. :wink: Se pa čisto strinjam glede čopičev… ELFovi so izredno trdi, kar samo oteži nanos, čeprav je npr. formula sama po sebi čisto dobra. Čopič vse pokvari.